James Maury Henson was born on the 24th September 1936, in Greenville, Mississippi, USA, and passed away on the 16th May 1990 in New York City, USA. He was a puppeteer, film director, producer, as well as a screenwriter, best known for producing “The Muppet Show”, as well as creating the Muppets marionettes and puppets, such as Kermit the Frog, Miss Piggy, etc. He was also recognized for working on the children’s TV show “Sesame Street”. His career was active from 1955 to 1990. So, have you ever wondered how rich Jim Henson was? According to authoritative sources, it was estimated that the total size of Jim’s net worth was over $20 million, which was accumulated through his impressive career in the entertainment industry as a puppeteer, director, producer, and screenwriter. He was also the founder of The Jim Henson Company and Jim Henson’s Creature Shop, which contributed to his overall fortune. Jim Henson spent his childhood in Maryland, the younger of two children born to Paul Ransom Henson, who worked as an agronomist in the U.S. Department of Agriculture, and Betty Marcella. He attending Northwestern High School, and during his studies he started working for WTOP-TV (now WUSA-TV), where he created puppets for the children’s program “The Junior Morning Show”. Upon matriculation, he became a student at the University of Maryland, College Park, where he majored in Studio Arts, and attended textiles courses in the College of Home Economics, from which he earned a BSc degree in Home Economics. While studying, he created “Sam And Friends”, which soon became extremely popular, encouraging him to continue with puppetry. During the 1960s, he created several popular shows, including “The Jimmy Dean Show” (1963) and “Time Piece” (1965), among others; however, the most popular creation came in 1969, the world-famous “Sesame Street”, and was a part of the show until his death in 1990. Jim continued successfully into the 1970s, creating “The Muppet Show” in 1975, which also garnered an enormous amount of fame, increasing the overall size of his net worth by a large degree. He has also created several TV specials on account of “The Muppet Show”, such as “The Muppet Movie”, “The Great Muppet Caper”, “The Muppets Take Manhattan”, “A Muppet Family Christmas”, among others, which also added to his net worth. Apart from the Muppets, Jim also created several other popular films and TV series, including “The Dark Crystal”, “Fraggle Rock”, “Dinosaurs”, and “The Storyteller”, among many others, which successes increased his net worth by a large margin. Thanks to his successful career, Jim received numerous prestigious awards, including the Oscar nomination for his work on “Time Piece”, and three Primetime Emmy Awards, for several of his creations such as “The Muppet Show”, “The Storyteller”, and “Sesame Street”. Furthermore, he received BAFTA TV Award also for “The Muppet Show”, and three Grammy Awards for “Sesame Street”, “The Muppet Movie”, and “The Muppet Show”. Jim also received a Star on the Hollywood Walk of Fame, although posthumously in 1991, as well as the Disney Legends Award. Speaking about his personal life, Jim Jenson was married to Jane Nebel (1959-1990), with whom he had five children. He was also known for being a philanthropist, as he established The Jim Henson Foundation. Unfortunately, hedied of toxic shock syndrome caused by Streptococcus pyogenes, at the early age of 53. 1 [in a 1983 interview] I've never planned my career. I found early on, the way I operate and the way I function is by doing what seems correct. One thing just sort of leads to another and just goes from here to there. I drive all my people crazy because I don't have a five year plan. 2 [on his relationship with Frank Oz] Certainly there would be times when our relationship wasn't great, but, much like a marriage, it IS a long time relationship! We know each other very well! It's very hard - there's a fine line; but Frank is a marvelous guy. He's fair; he's a funny man and a brilliant performer... I don't think there's another performer in puppetry who comes anywhere near what he does. 3 I don't talk about money. I think that any expensive movie is only going to hurt itself by talking about the amount of the budget. Nothing is ever worth it. 4 [in a 1983 interview] I started off alone and then with my wife. The first few years there were just a few of us, and then, as more people were added on, the work we are doing now is much more the work of a team... It's a marvelous group of people. We have a good time working, and I think our work is really good. I'm very proud of this kind of group thing that happens here. 5 [about Kermit] He can say things I hold back. 6 The most sophisticated people I've ever known had just one thing in common: they were all in touch with their inner children. 7 I've always tried to present a positive view of the world in my work. It's so much easier to be negative and cynical and predict doom for the world than it is to try and figure out how to make things better. We have an obligation to do the latter. 8 I love my work, I enjoy it. I have a terrific group of people who work with me. 9 Life is meant to be fun, and joyous, and fulfilling. May each of yours be that - having each of you as a child of mine has certainly been one of the good things in my life. Know that I've always loved each of you with an eternal, bottomless love. A love that has nothing to do with each other, for I feel my love for each of you is total and all-encompassing. Please watch out for each other and love and forgive everybody. It's a good life, enjoy it. 10 Some people claim Kermit is my alter-ego. I'm not sure I know what that means. I like to work Kermit because there's a lot of leeway for ad-libbing, which I don't have with most other characters but I'm not sure that I'm not Kermit. 12 If our 'message' is anything, it's a positive approach to life. That life is basically good. People are basically good. 13 I think there are lots of ways of leading very good lives and growing spiritually. This process of growth goes on whether we believe in it or not. 14 I spend a few minutes in meditation and prayer each morning. I find that this really helps me to start the day with a good frame of reference. As part of my prayers, I thank whoever is helping me - I'm sure that somebody or something is - I express gratitude for all my blessings and try to forgive the people that I'm feeling negative toward. I try hard not to judge anyone, and I try to bless everyone who is part of my life, particularly anyone with whom I am having any problems. 15 I don't know exactly where ideas come from, but when I'm working well ideas just appear. I've heard other people say similar things - so it's one of the ways I know there's help and guidance out there. It's just a matter of our figuring out how to receive the ideas or information that are waiting to be heard. 16 I believe that we form our own lives, that we create our own reality, and that everything works out for the best. I know I drive some people crazy with what seems to be ridiculous optimism, but it has always worked out for me. 17 I believe that life is basically a process of growth - that we go through many lives, choosing situations and problems that we will learn through. 18 I believe in taking a positive attitude toward the world, toward people, toward my work. I think I'm here for a purpose. I think it's very likely that we all are, but I'm only sure about myself. I try to tune myself in to whatever it is that I'm supposed to be, and I try to think of myself as a part of all of us - all mankind and all life. I find it's not easy to keep these lofty thoughts in mind as the day goes by, but it certainly helps me a great deal to start out this way. 19 Despite this discussion of things spiritual - I still think of myself as a very 'human' being. I have the full complement of weaknesses, fears, problems, ego, and sensuality. But I think this is why we're here - to work our way through all this, and, hopefully, come out a bit wiser and better for having gone through it all. 20 When I was young, my ambition was to be one of the people who made a difference in this world. My hope still is to leave the world a little bit better for my having been here. It's a wonderful life and I love it. 1 Shared his birthday with Steve Whitmire, his successor as the voice of Kermit the Frog. 2 In 1979's The Muppet Movie (1979), in which Kermit sang "The Rainbow Connection" while perched on a log in the middle of a swamp, required Henson to perform from a specially designed diving bell underwater. 3 A memorial service for Henson was held at London's St Paul's Cathedral following his death. At the entrance to the church was a plinth, on top of which sat Kermit the Frog, around his neck was a sign saying: "I've lost my voice". 4 Was raised on and heavily influenced by the early TV shows of comics Milton Berle, Sid Caesar and Ernie Kovacs. 5 Henson's alma mater, University of Maryland, commissioned a life-size statue of Henson and Kermit the Frog, which was dedicated on September 24, 2003. 6 Henson based his early Muppet designs on the drawings in "Pogo" by Walt Kelly. 7 Apart from his family and puppets, his greatest passion in life was music. 8 Was a lifelong fan of science fiction. 9 He legally separated from his wife Jane in 1986, but they never divorced. The two remained good friends. 10 His original name for the Muppets was the Anything People. 11 Upon his death it was said that Rowlf the Dog would never be used again, for this was Henson's signature character. As a memorial of sorts Rowlf is seen in a few shots of both Muppet Treasure Island (1996) and Muppets from Space (1999) both times performed by Bill Barretta. However, out of respect for Henson, Rowlf did not speak. It was not until The Muppets (2011) that the character had dialogue (spoken by Barretta). 12 According to an interview with Frank Oz, Jim wanted to direct and produce a film version of "Beauty and the Beast" in the late 1980s, with Tom Cruise playing the handsome prince who would turned into a beast. The storyboard was very similar to Disney's movie, even with the servants turned into magical objects, when the Walt Disney Company announced its intention of doing an animated version of the fairy tale, he decided not to go through with the production. 13 Biography in "The Scribner Encyclopedia of American Lives," Volume Two, 1986-1990, pp. 413-415. New York: Scribners/Simon & Schuster, 1999. 14 Henson's final televised appearance was on The Arsenio Hall Show (1989), just 12 days before his death. 15 1961: Met Frank Oz in Asilomar, California. 16 Had a hit single singing "Rubber Duckie" as Ernie. "Rubber Duckie" entered the Billboard Top 40 chart for pop/rock in August 1970 and stayed on the chart for seven weeks, peaking at number 16. The 'famous' rubber-duck-squeaking solo in the original version of the song (for the very first "Sesame Street album") is squeaked by the song's writer, Jeff Moss. When the Sesame Street (1969) cast appeared in concert with the Boston Pops Orchestra, the rubber duck was considered a percussion instrument. Apparently unwilling to pay musicians to play a 'second instrument,' duck squeaking was limited to the percussion section when the cast sang this song with the Pops (with Big Bird conducting). 17 Once said his earliest artistic influence was his grandmother, Dear. She taught him to value and appreciate everything he saw around him. 18 His earliest puppetry influences were Kukla, Fran Allison and Ollie, Bil Baird, and Edgar Bergen. 19 Arrived at his high school graduation in a new Rolls Royce Silver Cloud which he had bought with money he'd already earned with his puppets on his local NBC station. Remained a lover of expensive, luxury cars, whose collection would include a "Kermit-green" Lotus. 20 The Wizard of Oz (1939) was one of his favorite films. 21 "Lydia The Tattooed Lady" was one of his all-time favorite songs. The Muppets performed this song at his memorial service. Henson himself drew the tattoos on the Lydia, the female tattooed Muppet used in episode 2 of The Muppet Show (1976). 22 On a trip to Europe, he saw puppet theater being taken seriously by adults. He returned to the United States convinced he could create a puppet TV show that would appeal to adults. 23 His first television character was called Pierre, the French Rat. It began life as a comic strip drawn by Henson for a high-school publication in 1954. 24 In his early TV shows, he didn't always perform voices, but lip-synched to records of the day. 25 A Jim Henson retrospective was held from September 1990 to February 1991 at London's Museum of the Moving Image. 26 First met David Lazer when he had been contracted to make a few short puppet films for them. Lazer worked at IBM. 27 First met Jerry Juhl at a Puppeteers Of America convention. 28 Before his career in puppetry, he would experiment with 8mm and 16mm film, often making animation. 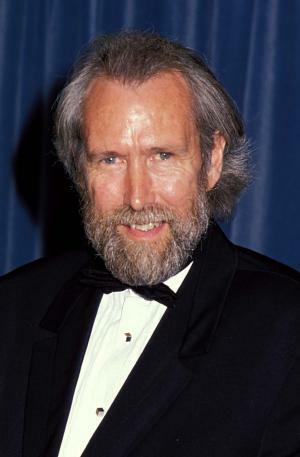 29 Was pictured on a USA 37¢ commemorative stamp issued 28 September 2005, which was issued on a single souvenir sheet honoring "Jim Henson, the man behind the Muppets". The souvenir sheet contained 10 additional 37¢ stamps featuring the following Muppet characters: Kermit the Frog; 'Fozzie Bear'; Sam the Eagle; Miss Piggy; Steve Whitmire & Dave Goelz; The Swedish Chef; Animal; Dave Goelz & Beaker; Rowlf; and Dave Goelz & Camilla. 30 Harry Belafonte sang the much beloved song "Turn the World Around" from The Muppet Show (1976) at Jim's funeral. It was reported to be his favorite. 31 His funeral at St. John the Divine in New York was attended by over 1,000 people and Muppets, including Frank Oz, George Lucas, Richard Curtis, Kermit the Frog, and Lord Lew Grade. 32 Was a good friend of George Lucas, who originally offered him the role of Yoda in Star Wars: Episode V - The Empire Strikes Back (1980). He declined and suggested Frank Oz for the part. 33 Had been ill with walking pneumonia for several days before his death but never told anybody, not even his family, because, true to his character, he didn't want to be a burden to anybody. By the time he finally sought medical help, it was too late to do anything. 34 Died the same day as Sammy Davis Jr..
35 Created the original Kermit the Frog out of his mother's old coat and a ping-pong ball. In the beginning Kermit was not a frog, but a lizard-like character. He gradually evolved, and first appeared as Kermit The Frog in Hey Cinderella! (1969) and has remained so ever since. 36 One of the main reasons why Henson preferred to use Kermit the Frog for his signature character was that he was the lightest in weight of the regular puppets and therefore one of the most comfortable for use for extended periods of time. 37 Teenage Mutant Ninja Turtles II: The Secret of the Ooze (1991) was dedicated to his memory. 38 Founded the "UNIMA Citations of Excellence" in 1973 to provide a peer-judged award for the art of puppetry in North America. In 1966, Jim Henson had previously founded (with other American puppeteers) the USA chapter of the Union Internationale de la Marionette (UNIMA) - the world's oldest international theatre arts organization, and served as the USA Chapter's founding chaiman. 39 Father of Brian Henson, Lisa Henson, Heather Henson, Cheryl Henson and John Henson. 40 Shares same birthday (September 24) with Steve Whitmire, fellow muppeteer who took over Kermit the Frog after Henson's death. 41 Named Kermit the Frog after a childhood friend from Mississippi. 42 Attended Northwestern High School in Hyattsville, Maryland. 44 Died a few days before the weekend he was going to sell his company to Disney, for a reported $150 million. Muppets Most Wanted 2014 performer: "Rainbow Connection" - as Kermit / writer: "The Muppet Show Theme"
The Muppets 2011 writer: "The Muppet Show Theme"
The Muppet Show Theme 2011 Video short writer: "Muppet Show Theme Song"
Forgetting Sarah Marshall 2008 writer: "The Muppet Show Theme"
Filthy Gorgeous: The Trannyshack Story 2005 Documentary lyrics: "The Muppet Show Theme"
3 Men and a Little Lady 1990 performer: "RUBBER DUCKIE"
Sesame Street, Special 1988 TV Movie performer: "Put Down the Duckie"
Count It Higher: Great Music Videos from Sesame Street 1988 Video short performer: "Doo Wop, Hop"
The Best of Ernie and Bert 1988 Video short performer: "I Don't Want to Live on the Moon", "That's What Friends Are For"
The Muppets: A Celebration of 30 Years 1986 TV Movie lyrics: "The Muppet Show Theme" / performer: "The Rainbow Connection", "Happy Feet", "Rubber Ducky", "It's Not Easy Being Green", "Mahna Mahna"
Sesame Street Presents: Follow that Bird 1985 performer: "Upside Down World"
Muppet Video: Muppet Moments 1985 Video performer: "Sax & Violence"
The Muppets Take Manhattan 1984 performer: "Together Again", "You Can't Take No for an Answer", "Saying Goodbye", "I'm Gonna Always Love You", "William Tell Overture", "Right Where I Belong", "Somebody's Getting Married", "Waiting for the Wedding", "He'll Make Me Happy", "The Ceremony", "Saying Goodbye / Together Again Closing Medley"
The Great Muppet Caper 1981 performer: "Hey a Movie! ", "Happiness Hotel", "Steppin' Out With A Star", "Night Life", "The First Time It Happens", "Couldn't We Ride", "Piggy's Fantasy Miss Piggy", "Finale: Hey A Movie! / The First Time It Happens"
The Muppet Movie 1979 performer: "Rainbow Connection", "Movin' Right Along", "Can You Picture That", "I Hope That Somethin' Better Comes Along", "Finale: The Magic Store"
Christmas Eve on Sesame Street 1978 TV Movie performer: "Have Yourself a Merry Little Christmas"
The Merv Griffin Show 1962 TV Series performer: "You And I And George"
The Mike Douglas Show 1961 TV Series performer: "You And I And George"
The Earth Day Special 1990 TV Special segment "Kermit the Frog"
1991 Star on the Walk of Fame Walk of Fame Television On 24 September 1991. At 6631 Hollywood Blvd.